Dr. Edward Graham grew up locally attending schools in Tracy before graduating from the University of the Pacific in Stockton. He attended UOP's School of Dentistry receiving his DDS degree in 1981. After starting his private practice in 1981, he served as a part-time instructor to UOP dental students at San Joaquin General Hospital's dental clinic from 1982- 1984. He is a member of the American Dental Association, California Dental Association and San Joaquin Dental Society. He also previously served as a Board of Director for SJDS and has also served on the chairs for SJDS completing his term of President in 2005. He has served locally on every major dental committee as well as various CDA and ADA positions. In 2005, he has bestowed as fellow in the Pierre Fauchard Academy. This organization seeks to support the highest dentistry throughout the world in both ethical and moral practice. 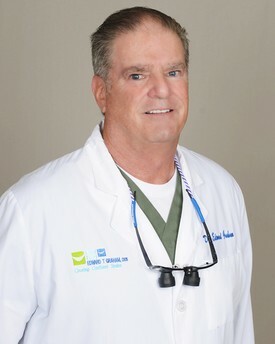 In 2012, Dr. Graham was bestowed as fellow in the American College of Dentists.The American College of Dentists (ACD) is the oldest major honorary organization for dentists. Its members have exemplified excellence through outstanding leadership and exceptional contributions to dentistry and society. Dr. Graham is a member of local and national service organizations and also is an active member of St. Basil's Greek Orthodox Church in Stockton. He also spends time as a volunteer at St. Raphael's dental clinic in Stockton. Dr. Graham is married and has 2 children.